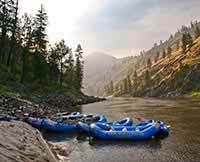 Great Idaho rafting vacation we’ll remember for years! We had a great group of guides on our July Salmon River rafting adventure that promoted a good sense of fun and fellowship on the trip. They were all very professional. This was a great vacation for our family that we will remember for years!